Regardless of whether you loved or loathed the movie, there’s no denying that Batman V Superman: Dawn of Justice had some issues. However, one thing which has become evident in the months since its release (especially with the the Ultimate Edition now available digitally) is just how much love director Zack Snyder poured into it. A legitimate comic book fan, the filmmaker delivered when it came to 300 and Watchmen, but alienated some moviegoers with his darker take on iconic superheroes in DC Comics adaptations like Man of Steel and, obviously, Batman V Superman: Dawn of Justice. However, he’s definitely done something interesting within the genre, and it’s easy to imagine both of those movies being looked back on in a very different way years from now. As things stand though, they remain divisive. 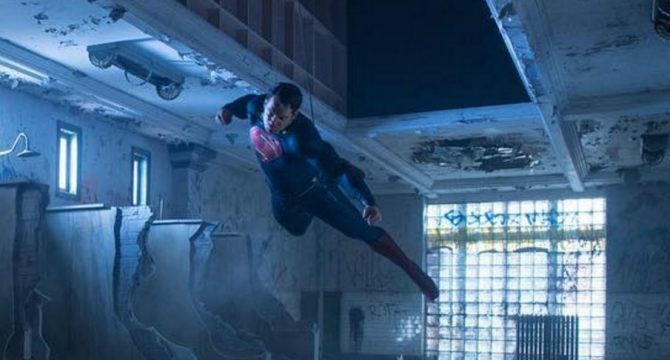 That hasn’t stopped star Henry Cavill from sharing an incredible behind the scenes image though, showing Superman taking flight against Ben Affleck’s armoured Batman. It’s a fantastic shot, and one which shows just how much of that undeniably awesome fight scene was shot practically. As Cavill points out, expect to see much more like this on the Batman V Superman: Dawn of Justice Ultimate Edition Blu-ray, which hits stores next week.